While comparative research is by no means new to the humanities and the social sciences, the field of media studies has been relatively untouched by explicitly comparative approaches. To be sure, influential strands of media studies such as the Toronto school of communication and the emerging field of media archeology are comparative in character. And yet, media scholars have by and large shied away from the formalization of a comparative methodology. One of the reasons for such hesitation may lie in the contemporary proliferation of information technologies and media cultures. As if the multiplication of the subjects of inquiry is preventing scholars from crystallizing common vocabularies and heuristics, without which any comparative endeavor can hardly take off. Comparative Textual Media, a collection of essays co-edited by N. Katherine Hayles and Jessica Pressman, counters this tendency by suggesting that “the deepening complexities of the media landscape” may in fact be responsible for “a reawakening of interest in earlier media forms” (ix). 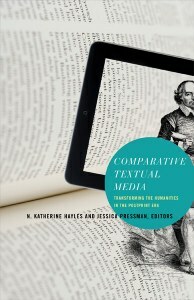 But rather than approaching these earlier media exclusively through the lens of computation—as in the case of the digital humanities—Hayles and Pressman contend that the time is ripe for a comparative analysis of all textual media. Early twenty-first century scholars are in fact in the privileged position of witnessing the emergence of new textualities as the age of print is coming to a close. This migration of text from static supports such as parchment, papyrus and paper to the procedural time of computer algorithms poses a series of questions on the ontological status of text. The thirteen contributors—Rita Raley, Adriana de Souza e Silva, Matthew G. Kirschenbaum, Johanna Drucker, William A. Johnson, Stephanie Boluk and Patrick LeMieux, Patricia Crain, Lisa Gitelman, Jessica Brantley, Thomas Fulton, John David Zuern, and Mark C. Marino—provide a range of insights that help advance our understanding of “what is a text” from a media perspective. Hayles and Pressman contend that such framework entails a focus on the materiality of media, and the complex interplay between the way a text is produced, stored and processed and the interpretive practices that determine its cultural significance. Several chapters in the collection attest to this approach. For example, Johanna Drucker’s fascinating chapter on the history of the typeface notes that font families emerge at the intersection of specific conceptions, technologies, and crafts. Thus, if the design of Renaissance fonts reflected ideal and classical notions of beauty, their implementation depended on writing techniques that reached their highest point only with “the virtuoso capacities of the writing masters of the seventeenth and eighteenth centuries” (89). This lack of synchronization across ideation, technology and technique, argues Drucker, reemerges also with the migration of the computer-generated typeface to the Web, when the limitations of early HTML barred Web designers from even choosing a font. Even more significant, perhaps, is the case of Donald Knuth’s failed attempt to design a single meta-font that could algorithmically describe, and hence unify, all typefaces. Drucker notes that if in 1982 Knuth had believed “that letters did not need a body,” the state of advancement of digital technology proved him wrong: “Sometimes technology leads, sometimes not” (85). The notion that a text should be gauged at the intersection of its material and ideational possibilities surfaces also in William Johnson’s compelling analysis of the Roman “bookroll” (more commonly known as roll or scroll) at the end of the Hellenistic period. Johnson notes that after the Romans conquered the Greeks they adopted the scriptio continua of Greek literary texts, thus reversing the word segmentation of early Latin literary texts. While such choice appears impractical and inefficient to us, the uninterrupted flow of letters was meant to leave the task of interpretation to the reading circles that formed around each bookroll. These communities of practice were led by masterful readers who were able to convey the full meaning of the text through the right pronunciation, modulation, and phrasing. Because proficient reading skills were achievable only through the repetitive reading of a text, to become a master-reader one had be able to access the rolls and hence to be part of the cultured elite that controlled their circulation. But if reading entailed skills that were as sophisticated as those of the calligraphers who transcribed the rolls, then a thorough analysis of this medium, argues Johnson, calls for an “understanding of reading cultures… that insists on the symbiotics of medium, literary text, writer, and reader as something deeply embedded within society, culture, politics, ideology” (119). While sociological approaches to literature and media are nothing new, other chapters in this collection combine an analysis of textual media’s formal properties with the social context of their production and reception. Such is the case of Patricia Crain’s essay on nineteenth-century children’s literature and Lisa Gitelman’s chapter on job printing. Crain observes that as the modern publishing industry began to develop, books became some of the first commodities (middle-class) children got to own. On the one hand, some of these books reflexively tell the story of their own industrial making, hence celebrating their own modernity, wordliness and availability. On the other hand, Crain notes that the container-like properties of these objects—which allowed children to store notations, poems, and other ephemera—made them key sites for the representation of the self as endowed with interiority and an individual sensibility. While Gitelman’s essay is not concerned with subjectivity, it also looks at the intersection of a text’s materiality, social function, and conditions of production. The texts in question incorporate the vast assemblage of unbounded materials—such as posters, bills, tickets, leaflets, coupons, newspapers, bonds, certificates, and the like—that goes under the name of job printing. Gitelman aptly points out that noncodex print items are generally authorless, lack publishers and hence are not subject to copyright. Yet their volume is far from insignificant, as job printing seems to account for 30 per cent of the industry’s total output, meaning that “at least a third of this sector of the economy has gone missing from media history as well as from textual studies” (189). The ephemerality of job printing raises questions on how scholars are to approach materials that are more made to be used than to be (carefully) read and stored away. In this respect, the shift from reader to user belies the larger question of ephemerality in digital culture, a subject that cuts across several chapters of Comparative Textual Media. In her essay on interactive public art installations that display text messages sent by multiple users in real time, Rita Raley recognizes that what she calls “TXTual practice” can present challenges precisely because there is no durable object to recover and present for future study” (9). While Raley is right to observe that “the experience of ephemerality may push the parameters of a discourse on comparative textual media to a kind of limit,” her insistence on using the term “practice” to define participatory and process-based interactions in public space is not unproblematic. Citing Nigel Thrift, Raley contends that “practices [are to be] understood as material bodies of work or styles that have gained enough stability over time, through, for example, the establishment of corporal routines and specialized devices, to reproduce themselves” (8-9). If texting is undoubtedly a practice, according to the previous definition, texting for public display is probably not, as it lacks precisely the kind of habitual qualities that would make it a practice. The fact that art critics and media theorists are able to link these projects does not mean that participants who stumble upon them in public space know what to expect or how to communicate with unknown yet co-present others. Perhaps it would be more productive to think of these situated interventions as textual performances that alter, if only temporarily, the perception of a public space by intervening on the communicative patterns that define a situation as either private or public (cf. Meyrowitz). The difficulty in grappling with textualities that are unstable and ephemeral emerges also in the essays authored by Adriana de Souza e Silva and John David Zuern. De Souza e Silva’s chapter approaches this question by focusing on location-based narratives that leverage mobile annotation technologies. While early location-aware projects such as audio walks and mobile storytelling projects were often run by artists, the growing popularity of smart phones has led to a multiplication of location-based applications (from SCVNGR to Foursquare and Yelp!) that allow users to annotate places for a variety of purposes. Yet de Souza e Silva does not seem concerned by the fact that the vast majority of these apps are commercial and as such rely on databases whose function and longevity is exclusively determined by the owning companies. The question of how the cultural heritage of the digital age is to be preserved is addressed by Zuern in his review of My Name Is Captain, Captain, a literary CD-ROM authored by John Morrissey and Lori Talley in 2002 and based upon Bertolt Brecht’s 1929 cantata Lindbergh’s Flight. After noting how Morrissey and Talley produced their CD-ROM using proprietary software that is no longer supported by the most recent versions of the Apple OS, Zuern concludes that as a literary object Brecht’s cantata is more durable than its digital adaptation. The rapid obsolescence of digital text prompts him to sound an alarm bell for a comparative approach that is detached from a “curatorial commitment” and “practical efforts to keep those texts alive” (277). Unfortunately, Zuern’s appeal does not find many echoes in a collection whose authors are more concerned with analyzing specific texts than with understanding how those texts may be integrated within a wider ecosystem that does not take obsolescence as manifest destiny. Before concluding, let us briefly consider the essays authored by Mark C. Marino, and Stephanie Boluk and Patrick LeMieux. Marino’s chapter focuses on exquiste_code, a multi-authored text produced over the course of five days in 2010 by seven writers in a London art gallery. Networked via Ethernet hubs, the writers had to submit their contributions to a program that would randomly select and process their chunks of text by applying formal rules inspired by the Surrealist games of the exquisite corpse. Marino admits that the pleasure of reading the transcript of this collaboration—which includes the code that was used to process or “munge” the text chunks—resides more in “reverse engineering the process of creating the text” (285) than in interpreting its meaning. This means that exquisite_code can be experienced as a living text only through the performance-execution of machinic processes that subject it to constant transformations. Boluk and LeMieux reach toward similar conclusions when they describe the game Dwarf Fortress as a “process of intertwined production and play that is constantly engaged in a series of textual translations and remediations” (134). Free of set goals and playing rules—other than those of the algorithm that runs the game—Dwarf Fortress invites players to translate the impossible task of erecting a fortress into monumental accounts of their inevitable collapse. Similar to the munged text chunks of exquisite_code, these “dwarven epitaphs” are fragmentary accounts that let us glimpse the complex mechanics behind the game. But rather than forming a coherent narrative, Boluk and LeMieux suggest that these fragments point to a theistic cosmology that has strong resonances with modes of historical writing, such as the medieval chronicles and annals, which favor the simple recording of events over human causation. Perhaps the nonhuman cosmology of Dwarf Fortress can be read as a metaphor of the ontological status of text at the beginning of the twenty-first century. As previously noted, Hayles and Pressman suggest that a comparative analysis of all textual media acquires a particular significance in the postprint era. Yet after reading the contributions dedicated to digital texts, one wonders whether the codex’s crepuscule is only a harbinger of a wider extinction of text as a machine for the production of sense. Whether they are intended to be ephemeral (Raley), bound to obsolete software or proprietary applications (Zuern, de Souza e Silva), subjected to algorithmic processing (Marino), or procedurally indifferent to human agency and causation (Boluk and LeMieux), the texts in question no longer seem to fulfill a text’s etymological function of weaving the cosmos into readable patterns that resist entropy. Perhaps, then, these textual ephemeras and executables suggest that an important task for comparative textual media (CTM) could be to identify and develop resources that can counter accelerated obsolescence and support cross-platform analysis. Databases such as the Rhizome Artbase, the ZKM Media Library, the Whitney ArtPort, the Internet Archive Historical Software Collection, to name a few, host and make accessible digital texts bound to dated software, platforms and networks. The question is how academic institutions that are willing to embark on the CTM project can not only use these resources but feed them and expand them. In this sense, Hayles and Presssman’s salutary invitation to think of the CTM approach as collaborative and hands-on can be complemented by an invitation to explore how the new relational technologies can not only be analyzed as texts, but also as technical prostheses that support and exteriorize our collective memory (cf. Stiegler). Meyrowitz, Joshua. No Sense of Place: The Impact of Electronic Media on Social Behavior. Oxford: Oxford University Press 1985. Print. Stiegler, Bernard. “Relational Ecology and the Digital Pharmakon.” Culture Machine 13 (2012): 1-19. Web. Thrift, Nigel. Non-Representational Theory: Space, Politics, Affect. London: Routledge, 2005. Print. Marco Deseriis is Assistant Professor in the Program in Media and Screen Studies at Northeastern University. His book Improper Names: Collective Pseudonyms from the Luddites to Anonymous is a genealogy of practices of shared pseudonymity and is currently under contract at the University of Minnesota Press. Deseriis is the co-author of Net.Art: L’arte della Connessione (Shake, 2008), the first Italian book on Internet art. His writings on hacktivism, social movements, and the avant-gardes have appeared in journals such as the Journal of Communication Inquiry, Journal of Critical Communication/Cultural Studies, Theory & Event, Radical History Review, Subjectivity and Mute.